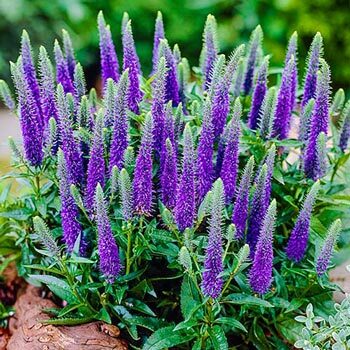 This easy-care, tidy perennial is perfect for filling in the front borders of flowerbeds and adding long-lasting, vibrant blue-purple color to the garden. Dwarf Blue Veronica's low, bushy mounds of dark green foliage grow just 12" tall. Blue-purple flower spikes open in early summer attracting butterflies and pollinators. While pollinators love this perennial, deer tend to avoid it. Dwarf Blue Veronica is a versatile perennial that is easy to grow in sun to partially shaded areas. While it prefers well-drained soils, it's adaptable to most soils, except heavy wet ones. 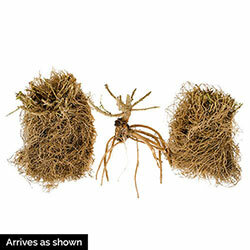 It's also a good choice for planting in pots and containers. Soil Requirements: Well-drained, adaptable to most soils except heavy wet ones. Growth Rate: Moderate once established, which takes approximately 4 - 6 weeks. Most varieties reach 12'', but height can reach up to 3'. Pruning: Can be divided every 3 years in spring or fall. To keep plants tidy, cut back by 1/2 after flowering. If not pruned in summer prune down to basal growth in late autumn. Winter Care: Mulch to prevent from frost heave in areas where temperatures fluctuate, causing freezing and thawing.